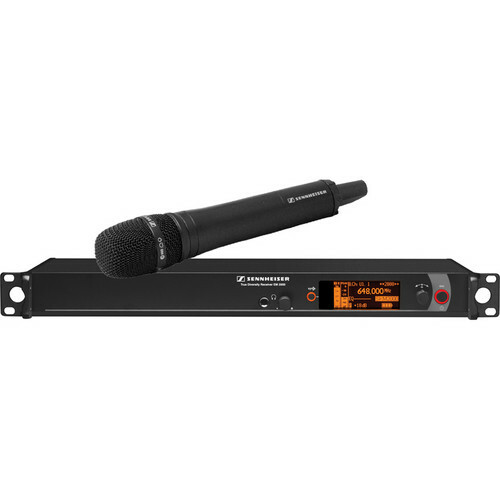 The Sennheiser 2000 Series Single Handheld Wireless Microphone System consists of the Sennheiser EM 2000 Wireless Receiver and SKM 2000-XP Handheld Transmitter with MMK 965 switchable cardioid and supercardioid, condenser microphone capsule attached. The system yields up to 3000 UHF frequencies and 20 fixed frequency bands with up to 64 compatible presets. In addition, Sennheiser Control Cockpit Software (download) offers easy handling, control, and maintenance for the Digital Wireless System. It provides a global overview of all network-enabled devices, shows all status information, and makes setting adjustments very easy.